A kitchen benchtop is not just a symbol of functionality or utility, but a very important element in the appearance of your kitchen. Kitchen benchtops are available with us to serve purpose in both style and functionality. More than just your kitchen workstation, we understand that a benchtop can be a highlight of style and class. Grandview Kitchens assist you in choosing the perfect kitchen benchtop from a wide variety, available in different materials, colours and sizes. We have laminate, stone and timber benchtops to choose from. Laminate kitchen benchtops by Grandview Kitchens are inexpensive and can easily emulate other kinds of materials. We have a great range of colour and texture choices that will suit any style of kitchen. They are low in weight and therefore, can be installed very easily. Stone benchtops are sturdy, hardwearing and look very attractive. They are available in Caesar stone, quantum, smart stone, silk stone, corion and granite. 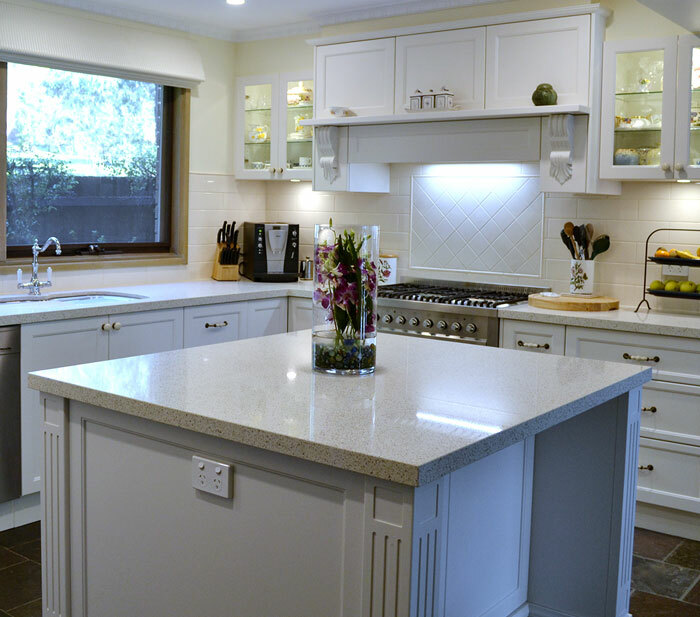 Caesar stone kitchen benchtops are made by mixing high proportions of quartz and a bonding agent, and remain the most favoured benchtops in Melbourne. Our bench tops are ultra modern, stylish, hygienic and easy to clean. Truly a unique design feature. Solid Timber Benchtops can add warmth and class to your kitchen. We will make sure that we guide you thoroughly as you make your choices for benchtops in Melbourne. For instance, we can advise whether the kitchen benchtop will blend with the rest of the kitchen decor, or the quality you are focusing on matches your kitchen needs and will stand the test of time. Our benchtop quality is marked by our expert workmanship, minute attention to detail and technical abilities. Our 35 years of experience allows us to help you design, build and install your dream kitchen with quality kitchen hardware and appliances. You can choose from a varied range of quality kitchen benchtop colours, textures and finishes at Grandview Kitchens. When choosing new kitchen benchtops, it’s important to think about certain aspects of your kitchen’s design and the way you use it. Appearance: How do you want the benchtops to look? Do you want a striking feature appearance, or to have them blend in more with the rest of the design? Durability: How hard are you on your benchtops? Do you need an exceptionally long-lasting material? Cost: What is your budget? Are you going to be staying in the house long-term, or are you making over the kitchen for a future house sale? Make sure you discuss with your Grandview Kitchens qualified kitchen designer about the answers to these questions. They can help you pick the perfect kitchen benchtops for you! 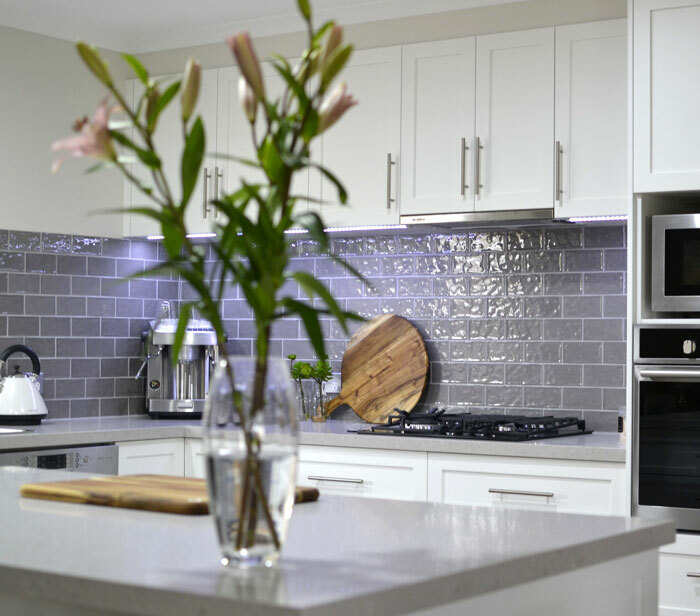 At Grandview Kitchens, we can source any type of kitchen benchtop you’d like! We will even complete the design for your benchtops as part of our end-to-end kitchen design and installation process. Looking for amazing kitchen benchtops to liven up your kitchen? Contact us at Grandview Kitchens now.